With displays demonstrated, a smart watch made from Glo's micro-LEDs could be on your wrist very soon, reports Rebecca Pool. They've been quite a while coming but later this year, smart watches with microLED displays, manufactured by Glo, should be commercially available. Based on red, green and blue microLEDs, Glo's prototype wearable display, measures 1.5 inches in the diagonal and packs in 264 pixels per inch. Crucially, the 20 micron InGaN microLEDs deliver extraordinary clarity on the same low temperature polycrystalline silicon backplane used in liquid crystal and organic light emitting diode displays. And while today's OLED displays produce a brightness of 1000 nits, Glo's display generates a dazzling 4000 nits with a wide colour gamut, a 120 Hz refresh rate and draws less than 1W of power. "Our displays deliver ten times more brightness and five times more power efficiency than an OLED display," highlights Glo chief executive, Fariba Danesh. "We are working with our manufacturing partners to launch in the latter half of this year, and we feel very confident and comfortable with this," adds Glo executive chairman, Aniruddha Nazre. Since spinning out from Sweden-based Lund University back in 2005, Glo has attracted more than US$150 million in funds from numerous investors including pan-European venture capital firm, Wellington Partners, Sweden-based Foundation Asset Management and most notably, Google Inc.
As Danesh points out, the company now comprises 65 employees, the majority of which are technologists, and many with in depth experience in compound semiconductors. Since the Google cash injection - the tech giant took at 13% stake in Glo - employees have been focused on producing devices, especially the smart watch, on low temperature polycrystalline silicon (LTPS) backplanes. "If the microLED display is to compete with OLED displays, it really has to leverage the existing LTPS backplane infrastructure," says Nazre. "So we've been working with the major suppliers of these backplanes and have a manufacturing agreement in place, with a second following soon." Crucially, Glo's microLEDs, operate efficiently at very low currents that are 1/100th that of typical LEDs. Operating at these microamp currents makes Glo's devices suitable for use with displays that are driven by transistors on LTPS glass substrates, as well as CMOS substrates. Indeed, as Nazre emphasises, Glo is, right now, the only company making microLED displays using off-the-shelf commercial LTPS backplanes. At the same time, the company has also been scaling LED manufacture of its red, green and blue microLEDs. As Nazre puts it: "Customers will want half a million, a million, five million or even more watches; if you cannot solve the capacity problem for them they will never touch you and commercialisation will always just be a pipe dream." To this end, Glo's microLEDs have, from word go, been designed with standard LED equipment at the company's pilot line in Sunnyvale, California. As a result, Danesh reckons the company can 'import' its processes into a high volume LED facility very easily. "Go into any LED shop and you will see that, in essence, they have the same tools as us; our focus has been to not customise anything that could create difficulties when scaling," she says. "Factor in that we can also use the backplane that is available in the market at high volumes and then you can see that we have a very simple supply chain." At the same time, Glo has used GaN to fabricate all of its microLEDs - red, green and blue - simplifying the display circuitry. And as Danesh asserts, device cost structures are good, relative to OLED displays. "We don't use these complex OLED lines, giving us significantly better costs," says the chief executive. "We have been able to leverage the existing economies of scale that are available to the display companies," she adds. "We really have opened a door for them to create new technologies that can compete with existing OLEDs while using their existing infrastructure, and this is also a huge opportunity for them." Still, microLED displays have been notoriously difficult to manufacture using traditional pick and place transfer processes, in which each sub-pixel is placed onto a backplane one at a time. To counter this, many companies have been developing mass transfer processes, including Glo. 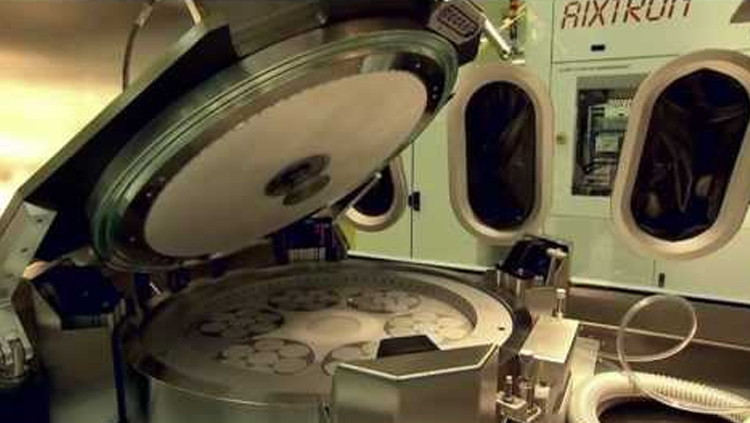 The company's scaleable, direct wafer transfer process allows it to manufacture 0.1 to 75 inch displays with resolutions up to 3000ppi on both LTPS and CMOS backplanes. Indeed, as well as its 1.5 inch wearable display, Glo has also showcased a 0.7 inch 1000ppi red, green and blue display for artificial reality and head-up displays on a CMOS backplane. And the company has produced displays, more than eight inch in the diagonal, with up to 200ppi for tablets, laptops, wall displays and more. "One of the differences with our 'mass transfer' process, compared to other processes out there, is that we use a completely selective direct wafer transfer," says Nazre. "So you can transfer the microLEDs from the wafers onto the backplane without using any intermediaries, and you can do this selectively." "This is unique and we have been doing it successfully for two years and counting on both silicon and glass substrates," he adds. Glo, alongside the likes of Sony and Samsung, will construct its larger displays from 'tiles' of microLEDs. But according to Danesh, thanks to the high precision of the company's mass transfer process, the so-called stitch lines between tiles that plague this modular approach aren't visible to the naked eye. "One of the challenges of tiling is these stitch lines which you just don't want to see," she says. "With Samsung's tiles, you can see these lines if you stand close enough, but using our process, the stitch lines are not even visible under 50X magnification." So with the microLEDs and the mass transfer process in place, where next for Glo? Success would seem to be the way forward. Given the much anticipated demand in the smart watch market, as well as head-up displays, industry analyst, Boris Kobrin from n-tech Research, recently predicted that the global micro-LED market will swell from $2.7 billion in revenue in 2019, to a hefty $10.7 billion in 2022. And while competition from the likes of Apple with Luxvue, Aledia, Sony, Samsung Electronics and many more is rising, Glo's leaders are not fazed. As Danesh and Nazre point out, Glo has both the InGaN microLEDs and mass transfer process in place, unlike many rival companies, and is set to produce bright, stable displays that can scale in size and production volumes. "Like everyone else, we think we're smarter than the rest," says Danesh. "But we've met the [key] technical challenges that allow us to make displays at a much larger scale that anyone else than we know."